1. Light charcoal grill or preheat gas grill to 350° to 400° (medium-high). 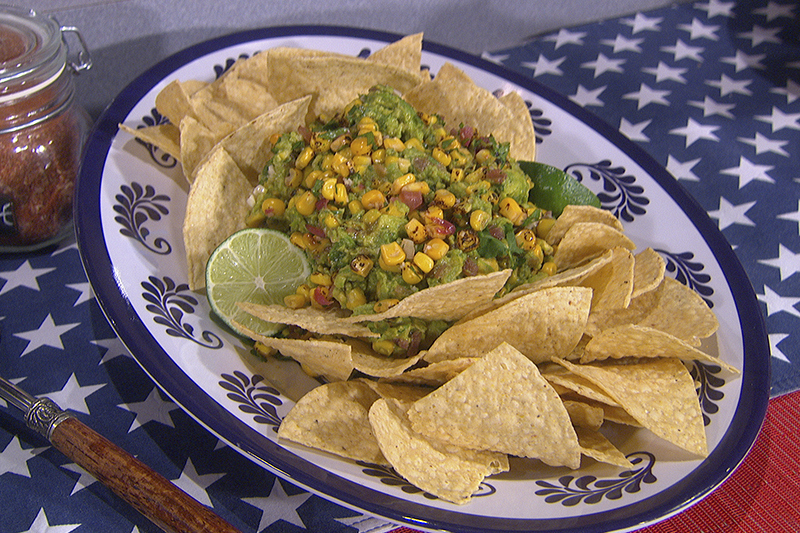 Brush corn, onion slices, and cut sides of avocados with oil; sprinkle with 1 tsp. rub. Grill corn, covered with grill lid, 12 minutes or until done, turning occasionally. At the same time, grill onion slices, covered with grill lid, 4 minutes on each side. Grill avocados, cut sides down, covered with grill lid, 3 minutes. Remove from grill; cool 15 minutes. 2. Stir together remaining ¼ tsp. rub, cilantro, lime juice, and garlic in a medium bowl. Hold each ear of corn upright on a cutting board; carefully cut downward, cutting kernels from cob. Add kernels to cilantro mixture, and discard cobs; chop onion and avocados, and add to mixture. Mash mixture with a fork or potato masher just until chunky. Serve immediately.